A statement from Tepco shortly after the blast said that pressure had risen again to 530 kPa by 6.50am. The company determined this was ‘abnormal’ at 7.44am and declared the matter officially to government. It began to gradually relieve the pressure, and carried out a “tentative evacuation” of the site, until it reached a level of 490 kPa at 9.05am. Chief Cabinet Secretary Yukio Edano said the plant operator Tokyo Electric Power Co. confirmed that the 11:01 a.m. blast did not damage the container of the No. 3 reactor, allaying concerns that the explosion may have caused a massive release of radioactive substance. TEPCO said three workers, including its employees, were injured by the blast. All of them suffered bruises. ”According to the plant chief’s assessment, the container’s health has been maintained,” Edano told a press conference. Here are some of the best updates available on the Japanese nuclear power plant situation (14 March 2011), following the massive earthquake and subsequent tsunami. In short, the nuclear reactor situation at Fukushima units #1 and #3 has stabilised with full containment intact (see below), and all other plants in the affected area are in cold shutdown. A very clear and readable statement (see 3 page document here) is also available, from the Federation of Electric Power Companies of Japan. Again, very worthwhile. Unit 1: Seawater injection continues and it is thought the reactor core is now sufficiently cool. Safety regulators consider reactor pressure of 353 kPa an indication of a stable condition. Unit 2: The normal reactor core isolation cooling system is in use. Fuel rods are covered by about 3.8 metres of water. Unit 3: Operations to relieve pressure in the containment of Fukushima Daiichi 3 have taken place after the failure of a core coolant system. Seawater is being injected to make certain of core cooling. Malfunctions have hampered efforts but there are strong indications of stability. Reactors 1, 2 and 3 were in operation at Tokyo Electric Power Company’s (Tepco’s) east coast Fukushima Daiichi nuclear power plant when the magnitude 9.0 earthquake struck. Three other reactors were already shut for inspection but all three operating units underwent automatic shutdown as expected. Because plant power and grid power were unavailable during the earthquake, diesel generators started automatically to supply power for decay heat removal. This situation continued for one hour until the plant was hit by the tsunami wave, which stopped the generators and left the plant in black-out conditions. The tsunami wave that hit the plant measured at least 7 metres in height, compared to the maximum 6.5 metre case the plant was designed to cope with. The loss of power meant inevitable rises in temperature within the reactor system as well increases in pressure. Engineers fought for many hours to install mobile power units to replace the diesels and managed to stabilise conditions at units 2 and 3. However, there was not enough power to provide sufficient coolant to unit 1, which came under greater and greater strain from falling water levels and steady pressure rises. Tepco found it necessary yesterday to vent steam from the reactor containment. Next, the world saw a sharp hydrogen explosion destroy a portion of the reactor building roof. The government ordered the situation brought under control by the injection of seawater to the reactor vessel. Professor Barry Brook, an environmental scientist at the University of Adelaide, said the effect on the Australian debate depended on whether it would be ”argued on a rational basis or an irrational basis”. barry: can someone address Alvarez’s comment? I don’t trust him from reading Gwyneth Cravens book. Still, that’s not a sufficiently scientific opinion. He is offering the scariest scenario and has offered them up before on spent fuel pools. so what to think about the spf? Is Alvarez spreading fear or being cautious or what? What comment is that GM? Too little information at this stage – even on what was stored there. But the lack of any marked increase at the site, and the near-background levels now being show, indicates that it is completely intact. Great stuff Barry. This site is proving to be an invaluable source of information on this event. Keep it coming. sorry barry: the citation from alvarez was from a hank roberts post on another thread. yikes: I don’t drink much but I need a drink. The New York Times says the crippled reactors will be releasing radiation to the environment for many months, and that radioactive cesium and idodine have been detected 60 miles away. Is the New York Times lying about this? I googled Japan’s typhoon season, and saw that it corresponds with the U.S. hurricane season. What happens in September, and what happens before that when prevailing winds change and blow from the east or north? Barry, thank you from the bottom of my heart for everything you have posted. I know you have been in contact with Josef and provided a great help. Your website is amazing. Thank you again. Explosion is being reported at #3 reactor on twitter by agencies. There’s been a second explosion, this time at reactor #3, the one fueled by the plutonium cocktail. Still nothing to worry about? Explosion seems to be another H2 buildup in the secondary reactor building – I suspect they could not vent sufficiently due to low power. The fuel, be it uranium or U-Pu MOX, is irrelevant unless containment is breached. There is no indication that this has occurred, just as in Unit #1. This appears to be a video of the explosion at #3. It does not look good. I’ve read through a couple of the comment threads on this site now, and am thoroughly unimpressed with both the quality of predictions, and general dismissiveness of the obvious nuclear power proponents populating this site. Go back and read statements made two days ago on this site, how vastly wrong they were in the service of downplaying the trouble happening in Japan. Easily more violent than the first at first glance. I just watched an MSNBC report on the condition of the Japanese reactors on television in Seattle Washington, aired at 7 pm P.D.T. The radiation leakage was declared to be already worse than TMI,. The senior science reporter for the network then said “some say” “1 million people” will eventually die as a result of what happened at Chernobyl, by way of explaining how bad such nuclear disasters could get. There was no mention that the Japanese reactors might be of different design, eg in the way of containment structure, or how they are moderated. A Union of Concerned Scientists guy was put on repeatedly, at one point describing his idea of a possible scenario for Japan of large regions being irradiated with thousands of deaths after a meltdown caused an explosion which ruptured all structures containing a core. It was stated that they wouldn’t be using sea water unless they were trying to avert something really drastic, and implied this was a catastrophe as great what they were alluding to. Then they ended with a statement saying take whatever the situation is as of now we believe it will get better in the days ahead. Why not yell FIRE!! in a crowded theater then conclude in a normal voice but it doesn’t look like there is a fire…. I don’t normally watch TV but it seemed this show had an abnormally colossal, if not titanic amount of time allotted to advertising. After the show was over I tuned into what has proven to be one of the most informative and reliable places for the latest information, and that’s you, Barry. Keep up the great work. WTH. This piece from the link above doesn’t seem to have made it into your “bottom line”. “The trade body said that a malfunctioning guage means that water levels cannot be confirmed. The gauge in question reads that water levels are around two metres below the top of the nuclear fuel assemblies, which would represent a very serious situation with the risk of fuel damage. “It is unknown whether [the reading] is real or not,” said JAIF. Other readings from the reactor system do not indicate that the reading – and the associated potential damage to fuel – are the true situation. The hydrogen buildup hints to exposed fuel assemblies. Also Gov had already judged core damage likely at both units 1 and 3 yesterday, IIRC. PS. It looks like your graphic has a part of the concrete containment structure labelled as “15 centimetre thick stainless steel” which is probably what the pressure vessel is made of. No reported increase in radiation outside the plant, so containment again seems secure. Yes, the graphic has confused concrete containment with the steel reactor vessel, well spotted David L.
They say a week is a long time in politics. The PM is supposed to be on ABC Q&A tonight and if I recall she is speaking to an audience at Adelaide Uni on Wednesday. It will be interesting to see how she handles the crowd who will be orgasmic over the death knell for nuclear. If the PM does a Merkel and promises to make wind and solar our salvation she may have to eat her words next week. When the dust settles literally and metaphorically it may still be only one person in Japan who has come to permanent harm. Regarding the used fuel pool, I think (not 100% sure, willing to be corrected) that the pool in the reactor building is actually just a small temporary pool used during fuel unloading, and the used fuel storage proper is actually outside the reactor building. Anyone know if there are any clear post-explosion pictures of the Unit 3 reactor building? The seven missing workers have been found and are safe. NHK is reporting six are injured. Presumably they were handling the pumping/cooling-jury-rigged operations perhaps? I am having a hard time keeping up with all of the news reports. Is there risk/chance of this same sort of hydrogen explosion happening at any of the other reactors in question or have they all been sufficiently stabilized at this point so as to make that unlikely? How long would it take for the cooling process to be completed? The recurrent thought running through my head while reading your article was “Thank God these are Japanese designed” since I truly respect the engineering of Japanese products. I don’t know about #3, but #1 (the first to vent hydrogen that then exploded) was a U.S.-designed Westinghouse reactor. What is the mater with people on this site??????? John was referring to the power plant event, not the earthquake + tsunami events, obviously. – 2 workers of cooperative firm were injured at the occurrence of the earthquake, and were transported to the hospital. – 1 TEPCO employee who was not able to stand by his own with his hand holding left chest was transported to the hospital by an ambulance. – 1 subcontract worker at important earthquake-proof building was unconscious and transported to the hospital by an ambulance. – The radiation exposure of 1 TEPCO employee, who was working inside the reactor building, exceeded 100mSv and was transported to the hospital. – 2 TEPCO employees felt bad during their operation in the central control rooms of Unit 1 and 2 while wearing full masks, and were transferred to Fukushima Daini Power Station for consultation with a medical advisor. – 4 workers were injured and transported to the hospital after explosive sound and white smoke were confirmed around the Unit 1. It says all six reactors at the site were designed by General Electric. The reactor for Unit 1 was supplied by GE, whereas the reactor for Unit 3 was supplied by Toshiba. Units 1 and 3 are said to have the same type of containment, i.e. the Mark 1 light bulb torus depicted in Barry’s diagrams. The power output of Unit 1 is 460 MW whereas Unit 3 is 784 MW. Disdaniel – I understand that sentiment but these plants just went through a category 9 earth quake and a tsunami. The design criteria isn’t “nobody gets hurt in worst case scenario” but “core remains contained” and public isn’t harmed. From a design perspective it isn’t unreasonable that some people get hurt under this scenario or that some parts of the building get’s damaged. Although both those things are obviously regrettable. Sorry if this has been answered on another thread but what is causing the hydrogen buldup? Hmm, I’ll wait on the post explosion pictures for #3 to say anything definite about that one. The pictures for #1 were enlightening in the limits to damage; I trust the #3 ones will be also. Paul K2 – If anyone is smug and preachy, it’s you. The amount of plutonium in unit#3 is irrelevant, since it’s staying put, although I would be interested to know the sources for your titbit of scaremongering. #3 outer building looks worse than #1 — more crumpled along the walls, but that containment structure is incredibly sturdy and intact — doing what it was designed to do. There is likely enough plutonium in Unit 3 to kill every person on planet Earth, and the only thing keeping the primary containment intact right now, is the manual venting being carried out by the staff at the plant. Stop making such idiotic statements, or you’ll be put on moderation. I welcome freedom of speech and a diversity of views but not grossly alarmist misinformation. There is no conceivable way this could happen, any more than we could attach rocket boosters onto Mars and push it into the Earth. The depleted cranium link adequately describes the natural “talking points” being used by nuclear advocates to combat their opponents natural talking points. Step back for a moment from the immediate public relations combat and consider the situation more impartially. Even if there WAS a major Chernobyl style diaster, MOST of the arguments deployed against nuclear power would remain as invalid as they were after Chernobyl and the responses to them would remain as correct as they were. (Public perceptions are another matter, but this comment is trying to step outside that immediate focus). Likewise even if there was NO significant actual external death and destruction ONE of the beliefs strongly espoused here has been refuted by facts. 200,000 people were “conservatively” evacuated because there WAS a credible risk. It was a credible risk that Japan’s regulatory procedures had NOT required the reactor to be designed against. Moreover it was a RATHER OBVIOUS credible risk that an exceptionally large earthquake followed (as is not unusual) by a Tsunami would occur in a highly earthquake prone country on the “ring of fire”. The regulatory process was inadequate. This is quite simply beyond dispute. In the Electricity Costs thread regular posters here strongly argued that eliminating “over regulation” was a viable path to bring nuclear LCOE below that for coal, without a carbon price and without a huge R&D effort. Please note that in developing countries the only regulatory burden is likely to be the cost of corruption. eg Most Chinese and Indian coal plants don’t have the pollution controls mandatory in developed countries to avoid acid rain etc and the safety record of the Chinese coal mining industry is quite deadly. We don’t want safest. We want cheap electricity. The cheapest we can get!! So nuclear ought to already appear competitive in such countries if EU and US style regulation is the only obstacle. Nevertheless the figures still show higher LCOE for nuclear than for coal, even in China where corruption is quite extreme and planning and construction times are suspiciously short. I would worry more about some Chernobyl style setback occurring in a developing country as a result of relaxed regulatory environment. Even Japan has built nuclear plants in earthquake zones without sufficient protection to prevent extended closure with small radiation leaks following a quake and has also had shutdowns from discovery of falsified inspection records. This means they aren’t even adequately protecting the economic interest in safety that DV82XL explained. As well as this failure of regulation being indisputable it is also WELL KNOWN. I have added a link above to an article published in 2007 from a seismologist who resigned from the Japan’s expert panel on seismic guidelines for nuclear power stations. That article has now been widely referenced in today’s media eg guardian and many others. I haven’t noticed any reference here yet, but that is far more important than the precise details of the design flaws. Like it or not, nuclear power WAS NOT over regulated in Japan. Like it or not there is now no plausible argument that LCOE of nuclear could be reduced below coal by eliminating over-regulation. It simply will not happen. Regulatory costs WILL increase. So the proposals for <a href="http://fixtheclimate.com/"massive ($100 billion per year) publicly funded global R&D remain the ONLY viable path towards replacing coal. This site should shift its orientation towards advocating that a substantial share of that R&D funding go to 4th generation nuclear and measures to reduce the cost of improved safety, together with the necessary nuclear research and training institutions that will be required to meet potential future needs for staffing. Trying to “spin” the evacuation of 200,000 people and advocate immediate rollout with current or reduced levels of regulation is simply pointless. I’d like to 2nd Kevin Johnstone’s request for more information on why the H2 builds up and how to stop these alarming *looking* explosions in future (even if the reactor core is safe!). Cheers. What do you *think* would happen if the venting stopped? Have you read the differences between a core meltdown in these reactors and the core meltdown at Chernobyl? Did you know that these reactors have been designed — as a worst case scenario only — to facilitate a ‘safe’ core meltdown? Did you know that the containment vessel is shaped to spread the lava flow out into a thin pool which will cool the stuff and slow the reaction, preventing a ‘China syndrome’? Barry Brook, the hydrogen indicates the zirconium alloy cladding in Unit 3 has failed. Unit 3 fuel contains the plutonium, so the cladding failure indicates that the water circulated through the reactor core has become contaminated with plutonium. This contaminated water is present in the containment building that just blew up. Please tell us how you know that there is no possibility that this plutonium can be released to the environment? What is wrong with my analysis? I think the article that followed major damage to a Japanese nuclear plant in an earthquake 7 years ago linked above is worth reproducing in full to understand the centrality of the regulation issue. I had warned that a major earthquake would strike the Chuetsu region around Kashiwazaki, Niigata Prefecture, and about the fundamental vulnerability of nuclear power plants. The 6.8 magnitude temblor of July 16 caused considerable damage to the Kashiwazaki-Kariwa Nuclear Power plant operated by Tokyo Electric Power Co. (TEPCO), proving me right. In the 40 years that Japan had been building nuclear plants, seismic activity was, fortunately or unfortunately, relatively quiet. Not a single nuclear facility was struck by a big quake. The government, along with the power industry and the academic community, all developed the habit of underestimating the potential risks posed by major quakes. Since around the time of the Great Hanshin Earthquake that devastated Kobe in 1995, however, almost the entire Japanese archipelago has entered a period of brisk seismic activity. In the past two years, major quakes took place in close proximity of three nuclear power plants: the Onagawa plant in Miyagi Prefecture (August 2005), the Shika plant in Ishikawa Prefecture (March 2007) and the Kashiwazaki-Kariwa plant. In each case, the maximum ground motion caused by the quake was stronger than the seismic design criteria for the nuclear power plants. The latest temblor near Kashiwazaki generated a peak ground acceleration of 993 gal, compared with the design value of 450 gal. This is the kind of hazardous situation that a very quake-prone nation must expect to occasionally face when it operates so many nuclear reactors. There are, in fact, 55. What happened to the Kashiwazaki-Kariwa Nuclear Plant should not be described as “unexpected”. What happened there could have been much worse. If the focus of the quake had been a little farther southwest, toward the plant site, and the magnitude had been 7.5–the size of a quake that hit Niigata Prefecture in 1964–and if all seven reactors at the plant had been operating, genpatsu-shinsai, a combination of an earthquake and a nuclear meltdown, could have occurred. That would have been a catastrophic event where the damaging effects of the quake itself and radiation leaked from the plant reinforced each other. The period of high-level seismic activity will continue for another 40 years or more. Unless radical steps are taken now to reduce the vulnerability of nuclear power plants to earthquakes, Japan could experience a true nuclear catastrophe in the near future. The risk of such a nightmare is especially high for the Hamaoka Nuclear Power plant in Shizuoka Prefecture and the cluster of nuclear plants along Wakasa Bay in Fukui Prefecture. A serious accident at these facilities could have a profound effect on the three biggest metropolitan areas around Tokyo, Nagoya and Osaka. The latest temblor highlighted some fatal flaws in the old seismic design guidelines. But even the new guidelines that took effect last September in the first sweeping revision in 28 years are still seriously flawed because they underestimate design basis earthquake ground motion. I was a member of the expert panel that developed the new seismic design guidelines, but I resigned during the final stage of the work last August to protest the panel’s stance on this issue. This defect must be fixed quickly, learning from what happened at the Kashiwazaki-Kariwa plant. TEPCO has been criticized for failing to sufficiently consider the submarine active faults near the plant. Many experts argue that thorough seismic research under the new guidelines will prevent such an oversight in future. But a strong earthquake of up to about 7.3 magnitude could directly hit an area where even perfect seismic research could not discover an active fault line. So the guidelines should require that a nuclear power plant, no matter where it is located, should be designed to withstand at least the ground acceleration caused by an earthquake of about a 7.3 magnitude, roughly 1000 gal. In fact, however, the new guidelines require only about 450 gal. This figure should be raised substantially, and all existing nuclear power plants should be examined rigorously according to the revised criteria. The facilities that cannot be improved under the revised criteria should be shut down. The most serious fact is that not only are the new design guidelines defective, but the system to enforce them is in shambles. Much of the blame for the underestimation of the active fault line near the Kashiwazaki-Kariwa plant rests with the shoddy examination of TEPCO’s design for the plant that overlooked the problem. In The Asahi Shimbun’s column on Sept. 16 last year, I pointed out that an active fault line had been overlooked in the process of designing the Shimane Nuclear Power Plant in Shimane Prefecture, a serious oversight in the safety inspection. But no action has been taken to address the problem, demonstrating the irresponsibility of the nuclear safety authorities. The expert who advised the power company and took part in the safety inspection–the person responsible for the underestimation of the fault line–is still in an important position on the panel of the Nuclear and Industrial Safety Agency. A senior agency official recently said there will be no new review of the seismic design guidelines, at least for the time being. But the guidelines are under the jurisdiction of the Nuclear Safety Commission, which is supposed to be an independent and neutral regulatory organization. By saying so, the official overstepped his authority, and his remarks clearly demonstrated how the commission is susceptible to government intervention. All these facts add up to a policy failure as serious as the blunders that led to the HIV-tainted-blood scandal and the recent pension record-keeping mess. The Diet should take a good look into the government’s flawed nuclear safety policy along with the problems caused by the recent earthquake for a radical reform of the government approach to ensuring the safety of nuclear power plants. Otherwise, there can be no viable future for Japan’s nuclear safety. Ishibashi Katsuhiko is a professor at the Research Center for Urban Safety and Security of Kobe University. This article appeared in the International Herald Tribune/Asahi Shinbun on August 11, 2007). Posted at Japan Focus on August 11, 2007. Arthur, I have had the evacuation thrown at me enough that I am weary of pointing out that evacuation is not evidence of harm. Yes, there was damage to the infrastructure in Japan’s biggest ever earthquake. The fact remains that this particular incident at Fukushima has not been a significant problem relative to the rest of the infrastructure problems from the quake. It’s UCS, so I can understand if they’re unpopular. The have come though it. And the public is not in serious danger, yet, and most likely won’t be, even if there were a meltdown, due to the working containment. Problems: For one thing, the emergency backup power failed. This is the most serious problem. Why did it fail? I’ve heard it said that they didn’t predict that a Tsunami might hit backup generators. Is that true, or false: this is checkable. Secondly, when new backup generators were brought in, I read “somewhere” that they could not work with the reactors’ power systems, in the state they were in. I’m not sure why: but they probably should have worked. That they didn’t work might indicate a problem beyond the generators themselves. But I have read that it was some electronic incompatibilities between the new generators they brought in, and how they were to be hooked up in the plant. That’s something that ought to have been planned for. Thirdly: because the emergency backup power was knocked out, was it wise to have earlier started the process of shutting down the reactors? In hindsight maybe not, but it may have been the right decision given the information at the time. And they were obviously playing the situation by the book (which you should be doing, in an emergency). If the reactor was running, there would have perhaps been sufficient power to initiate a shutdown, when they were sure it was safe to do it. To explain vaguely: If onsite backup generator power is less reliable than a running reactor, and a stopped reactor needs power, perhaps there is less risk running the reactor, keeping sufficient power, and only shutting it down if you’re certain backup generation will be available to cool the core. If the reactor is in any way unstable, quench it immediately while you still have power. These multiple incidents of varying severity have caused way more damage, political and psychological, than the value of the reactor. Quenching the reactor immediately, in hindsight, would have been better than the course of action taken. Was this predictable? What’s wrong with your analysis is that it’s damned inconvenient. Eclipse Now, asked what would happen if they stopped venting steam from Unit 3. If the venting from Unit 3 stopped the pressure in the containment would build up since the steam would not be vented. The temperatures in the reactor would rise above the critical temperature of water (374 deg C), if the temperature isn’t that high already, and the pressure would hit the critical pressure of water over 22 MPa (over 3200 psi for US readers). Even if the primary containment vessel could hold this pressure above the critical temperature of water, at some point the supercritical water fluid would continue to exert even higher pressures as the core heated the fluid. Eclipse Now, are you claiming the primary containment vessel can withstand the pressure and temperatures associated with supercritical water? [ad hom deleted] but the reality is Arthur’s analysis (and my similar questions) are right. The already uneconomic costs of nuclear are about to go higher still. There are problems in a renewable future for sure, but we could get on and solve them, rather than let “too cheap to meter” derail us once again. have you got *sources* for how many people are going to die of radiation poisoning? How much is known about the effect of 3000F seawater on the steel containment vessel? Sorry, what claim did I make? Not to ever try to tell an engineer something he doesn’t know (they hate that), but Cassadra was right. Look it up. These days, you won’t even have to read the whole book. Oops, it’s Cassandra. The “n” key on my computer is stuck. apologies… I’m not having a good day, it was “The Truth” that made the following claim. Here, engineers, I even did the work for you. Now all you have to do is click, and read for a minute or two. Thing is Nervous, there’s no alternative (yet) that I can see. We simply have to go down the nuclear route. There’s no choice in the matter. Wind and solar can’t do reliable baseload year in year out, period. So even IF — and this seems impossible at this stage — the core were to blow and turn 200km of Japanese land into a new wildlife park for the next few centuries (like Chernobyl), it’s an old technology. It doesn’t have the passive physics of expanding fuel rods which lead to Neutron Leak which shuts down the reaction. There’s a whole new world of nuclear power up and running since these old beasts were built. Hysteria is not confined to schoolgirls,apparently. Neither is spin confined to politicians and the MSM. Barry,I know you mean well but I think providing a venue for the trash which have infested this site is a mistake. Much better to have waited until the Japanese situation has stabilized. It’s unfortunate that generators failed and heard that Reactor #3 is more dangerous than #1 because it is a MOX (Mixed oxide) reactor. It has a greater chance of melting down. Hope everything settles down as soon as possible. Most regulars on this website are against the kind of debacles that plagued reactor construction, especially in the United States during the 1980s. These included regulatory ratcheting effect (etc). The only person to advocate actually reducing the level of nuclear safety was Peter Lang, and you know what? Many regulars disagreed. I think Brook did too. [not correct] Maybe you should read more posts by DV82XL on this issue, and there was also an article on “Seeker Blog” related to this issue (it’s in the blogroll). It remains to be seen how much this will impact the costs in most countries of new generation 3+ nuclear, which have containment buildings two orders of magnitude better and generally don’t need AC power for safety related systems. However, I can see an enormous scandal in Japan resulting, perhaps resulting in the immediate closure of all reactors with the MK-1 containment, and massive modifications to the rest. That’s my guess. In any case, we shouldn’t speak too soon, because the final fate of the reactors are still unknown. We should be implementing nuclear and renewables while improving and solving the problems of both. I don’t see any way around this. Seems like you have arbitarily decided that renewables are the way to go, which was actually not Arthur Dents analysis at all. Accusations that the media have over-hyped the event (etc) does not mean that the tragedy of the event has not been recognized. Also, apparently the containment building remained intact from the explosion, because apparently the explosion occurred above the containment building. I am more worried about the fuel damage breaching containment over the next few days. Also, Plutonium is generated in any reactor that has Uranium-238 in the fuel, including Reactor #1. Reactor #3 just has more because some of the fuel has more of it. US 7th Fleet moving away from the coast of Japan to avoid radiation from stricken Nuclear power plant. What I have noticed in this debate is that if you divide the speakers into two groups there’s a stark difference. Those who are “pro-nuclear”, by and large (with a few exceptions, of course) tend to support their arguments with facts and logic. Thos who are “anti-nuclear” seem to rely on assumption, emotion and misunderstood factoids. This is very concerning, and points to a dreadful dearth of scientific education. It is particular concerning to see such a hotbed of ignorance in Greenpeace, which as an organisation encouraging scientific understandings of the environment should know better. “Barry Brook, the hydrogen indicates the zirconium alloy cladding in Unit 3 has failed. Unit 3 fuel contains the plutonium, so the cladding failure indicates that the water circulated through the reactor core has become contaminated with plutonium. This contaminated water is present in the containment building that just blew up. 1. The hydrogen does not indicate that clad has failed. It may have gotten too hot for some period, producing H2 via recat, or there may be an alternative source of the hydrogen — I think the latter explanation is more likelyRead this new BNC post. 2. The Pu can only be exposed to the environment if the reactor vessel and concrete containment are catastrophically breached. Are you proposing this? What is the mechanism? 3. If #2 somehow occurs, the Pu can only be dispersed if you have some mechanism for aerosolising it and then keeping it suspended. Do you have one? Sounds serious. But wait… wasn’t there also something on the news the other day about an earthquake or something? please promise you’ll stick around until say the last week of April. Give us a month to see how this all pans out hey? Then you’ll be able to scream “I told you so!” if something has happened to these old reactors. I’ll even agree with you that we shouldn’t be building old Gen2 reactors in that case, hey? Isn’t it a good thing we have Gen3 and nearly Gen4 reactors to turn to instead! Of course everyone is reviewing nuclear safety, thats what happens when incidents occur. Just between you and me, though, I’m not sure how much Austria is going to get from reviewing their plant’s tsunami preparedness. “The Truth”, that is a blatant ad hominem and violates this website’s commenting rules. Do it again, and you’re blacklisted. Same deal for anyone else involved in this kind of character assassination. Unacceptable. Half a dozen repeated commenting rules violators have been put on moderation. Aftershocks are ongoing across Japan, spreading continuing panic, reports the BBC’s Clive Myrie in the northern coastal city of Sendai. There has been a spike in demand for iodine in the city, as people try to counter the effects of radiation, adds our correspondent. The thing about science is you can look at what’s being said, follow the logic, refute it if you think it’s wrong, propose alternative explanations, etc. I think many people have had a bad science education and media personalities are no exception and as a result don’t have a good foundation to asses facts from fear mongering. Too many people are taught to just believe what they are told from a group and a result come to depend on being told what to believe rather than thinking for themselves. I think the reason why many people here, including me, believe the situation is not as bad as the media hypes it to be (including UCS hype in my opinion) is that they have a science background to asses the facts. However I do think we need more info from Japan. Thank you Barry. You’ve put together an excellent resource on an evolving situation in a remarkably short period of time. So, what is the status right now? What about the cooling, there has been quite a few flashes that cooling/water injection has failed across reactors 1, 2 and 3 this morning (my time). I havent found any details as to why (if true) this has happened. Thanks for keeping this going, I’m following quite a few “news outlets” and making sure I keep reading between the lines as well as taking stock in experts on “both sides” here. Thank you Mr. Brook, and all the others, who have provide this excellent discussion of the risks. I live in Tokyo and am faced with the real decision of evacuating with my family (with young children) or not. Thus please address the specific circumstances as have evolved in Units 2 and 3 over the past day. PLEASE respect the difficult decision I and other must make and keep the anti/pro nuclear religious rhetoric out of this discussion. The core of both units have been partially or completely exposed for some period hours. This seems to imply that a complete core “melt down” is probable (yes or no?). If such happens what is the risk that the outer containment will breach? If there is a breach what is the transport mechanism and time for the radiation to reach a 200km radius? p.s. sorry for cross posting but obvious this is an immediate issue for my family. @Scott, I mentioned DV8XL’s position in the long quote above. Follow the link to the earlier Electricity Costs thread and you will see that I explicitly referenced a discussion in which it was obvious that only Peter Lang argued for a reduction in actual safety engineering with claims that existing designs are too “gold plated”, but there was much wider agreement (except from me) that costs of excessive regulation (especially unpredictable delays) could be eliminated (without reducing ACTUAL safety) to bring nuclear LCOE below coal. Now read my above comments and the Japanese seismologists statement from 2007 again. The issue I raised was about obvious regulatory failure and the inevitable consequence that instead of it being possible to reduce regulatory costs they are certain to rise as a result of this. My conclusion is that nuclear cannot achieve an LCOE below coal without massive R&D (I agree with you that such R&D is unlikely to result in a renewables solution). Since it is obvious that the third world countries industrializing over the next 50 to 100 years and producing most of the expected emissions will continue to use the cheapest available generation technology it should also be obvious that developed countries should put all available resources into developing cheaper clean energy technology (including fission and fusion) and not waste any on futile deployment of more expensive technologies such as renewables and current fission that can only rely on subsidies or carbon taxes and therefore cannot replace fossil fuels in developing countries. The blind spot here is so deep that I am tempted to say it amounts to a form of “denial”. There was nothing ambiguous in my post about regulatory failure and its implications for costs that could result in a reply based on the safety of current versus older technology. That confusion on your part reflects the same focus on the technical details to avoid facing really OBVIOUS facts about costs and regulatory failure as the new thread with breathlessly premature speculation on the precise technical mechanisms without the benefit of the inevitable future thorough investigation. This contributes nothing to public understanding of the real issues at stake but helps to keep your own minds off the need to re-think your own positions. It is obvious why anti-nuclear advocates would want to avoid discussing the obvious regulatory failure so as to suggest that the technology itself is inherently unsafe. It is a lot less obvious why pro-nuclear advocates are not leaving the Japanese regulatory agencies to dangle in the breeze but instead discrediting themselves with suggestions that complete destruction of 2 or 3 reactors and evacuation of 200,000 people is not a serious problem. You could simply admit that regulation will need to be tightened. But then you would also have to admit that coal will continue to be cheaper than nuclear. So your minds wander off into the technical details. Stop spinning and obsessing and start advocating massive R&D (including a share for nuclear). fully exposed to what? I need more information, as the following piece seems to indicate it is part of a cooling down strategy. I’d be more concerned if it said “Reactor core breached and exposes the fuel rods to the outside atmosphere” but there’s nothing like that here. So what are the fuel rods exposed TO? Arthur, you are like a broken record. So now we know as a matter of fact that some melting has occurred due to the rods being exposed. 99% likely that some reactor core has gone through the floor of the containment vessel and into the ground underneath. Which is probably why a large number are being treated for radiation poisoning. From BBC – The fuel rod exposure at Fukushima Daiichi number 2 reactor is potentially the most serious event so far at the plant. A local government official confirmed the fuel rods were at one point largely, if not totally exposed. Without coolant around the rods, temperatures can rise to hundreds of degrees Celsius, almost certainly resulting in some melting. Part of the cooling down strategy?! I’ve heard of clutching at straws you are really desperate now. BBC live updates: A quick summary of the nuclear crisis in Japan: The nuclear emergency following Friday’s earthquake and tsunami has worsened, with the operators of the damaged Fukushima nuclear plant warning that they can’t rule out a possible meltdown. The company says it’s possible that cooling water at the number two reactor has evaporated, exposing the nuclear fuel rods. The BBC environment correspondent Richard Black says such an outcome would be very serious. Another explosion, 2 deaths, 20+ injuries, 22 being treated for radiation poisoning with 190 more feared contaminated, US Navy retreating as they are being exposed over 60 miles away and now the cores being fully exposed and melting later – feeling just a little embarrassed about that? Well the war isnt over yet and no, it hasnt burned into the ground. As far as I can tell this is partial melting of (some of?) the fuel rods. This is expected to have happened in 1 and 3 already so this No. 2 is following the same line. This is of course very bad, I think we can all agree on that, but its not (yet) time to run for the hills. Thanks Barry, I’ve now read the updates too. You seem to know so much of this, I trust your opinion completely. Thanks for keeping things in the right perspective. Keep us all posted! That’s a new definition of brave or is excluding nuclear in its energy policy such a risky move for Germany? Some of the statements from governments around the world are so disappointing. Take the Austrian Environment Minister Nikolaus Berlakovich who (AFP via BBC’s Live stream) has called for speedy checks on Europe’s nuclear power plants to see if they can withstand earthquakes and to verify if the plants’ cooling systems would continue to function in the event of a disaster. Of course they can withstand Earthquakes, they’ve probably withstood several today. The question is what magnitude they can withstand. As it stands, the statement is unnecessarily alarming – were a relatively minor, say ~M4 earthquake to strike Austria today, what might the public reaction be? It would be a reasoned approach to state that they would study the Fukushima incident for lessons on safety and review their nuclear plants, but that’s too much to expect from some politicians I suppose. I looked at the BBC article mentioned above, i.e. http://www.bbc.co.uk/news/world-asia-pacific-12733393 “Meltdown alert at Japan reactor” with its sidebar by Richard Black. According to Black, a “serious meltdown” is where “molten, highly radioactive core falls through the floor of the containment vessel and into the ground underneath”. Its too bad they designed the reactors Black is imagining where melted core can just “fall through the floor”. I guess if there were any of those reactors in Japan, its the end for trillions of Japanese. (If we count all the possible descendants over billions of years of any who are eventually killed). In this article, the consequences of a meltdown are described. According to this article, “the Three Mile Island meltdown caused no significant environmental degradation or increased injury to any person, not even the plant operators who stayed on duty. It has been said that this lack of public impact was due primarily to the containment structure. But studies after the accident showed that nearly all of the harmful emission products dissolved in the water and condensed out on the inside of containment surfaces. Even if containment had been severely breached, little radioactivity would have escaped. Few, if any, persons would have been harmed. To test how far the 10 to 20 metric tons of molten reactor penetrated the 13 cm thick bottom of the reactor vessel on which it rested, samples were machined out of the vessel and examined. The molten mass did not even fully penetrate the 0.5 cm cladding, confirming tests in Karlsruhe, Germany, and in Idaho, that the China Syndrome is not a credible possibility. The ignorance of the media reporting is depressing. Their priority seems to be to hype up the extremely remote possibility that the troubles at Fukushima will result in a serious leak of radioactive material. Meanwhile, a Tsunami really has just wiped a bunch of towns and cities off the map, the death toll really will in tens of thousands at least, and millions more really are in a humanitarian crisis NOW. Quite frankly, even the alarmist scenario of another Chernobyl pales by comparison with the scale of disaster that Mother Nature has just visited upon Japan. My heart truly goes out to the people of the region. My concern is for friends in Tokyo – what are the risks, should they leave? There is no advice anywhere on this. There is a 70% chance of another above-6 earthquake, & tsunami, within the next few days. What about the three nuclear power stations that are already in trouble if this occurs? Is it better to leave now, as if the worst happens it might not be possible to get out, especially in a country already dealing with a massive disaster. And that volcano in the south just erupted again! There have been quite a few criticisms in the past of the authorities and electricity companies in Japan for building these power stations to lower safety standards than they might experience when the plates slip. The critics were right. @ Tatu – Industrial accidents happen all the time, all over the world, Emergency crews lay their lives on the line every day, and I suspect in Japan over the last 72 hrs there have been hundreds of untold stories of heroes putting themselves at great personal risk beyond this small corner where the reactors are. Your attempt at painting the workers at the plants as victims of nuclear energy is both pathetic, and disrespectful of all those putting themselves on the line, all over Japan at this time. As I understand it (and your commentary here has been instrumental along those lines), three of the six reactors at Fukushima were offline for inspections when the earthquake hit. The primary problem now, it seems, is that the primary cooling systems are not working because they are not powered and so emergency measures are being employed. How long does it take to bring a reactor online? Could (one of) the other three reactors which were largely inert during this crisis be brought back online to power the cooling systems? The best quackery I hear from media and some panic stricken individuals is: “1 million people” will eventually die as a result of what happened at Chernobyl. This figure is completely wrong! Far more people will “eventually” die, but it will not be from radiation, it will be from old age. World Health Organization is closely monitoring aftermath of Chernobyl and there is no evidence that people are dropping like flies before their time. The bottom line is: The low level radiation is not as deadly as some doomsday propagandists would like to make us believe. The Japanese government has asked the IAEA for experts to come in and help. Does this mean they’ve reached a stage where they can do no more on their own? What would the situation have to have become for Japan’s own experts to seemingly “give up” and ask for help? “… acute crisis developed late Monday at reactor No. 2 of the plant, where a series of problems thwarted efforts to keep the core of the reactor covered with water — a step considered crucial to preventing the reactor’s containment vessel from exploding and preventing the fuel inside it from melting down. 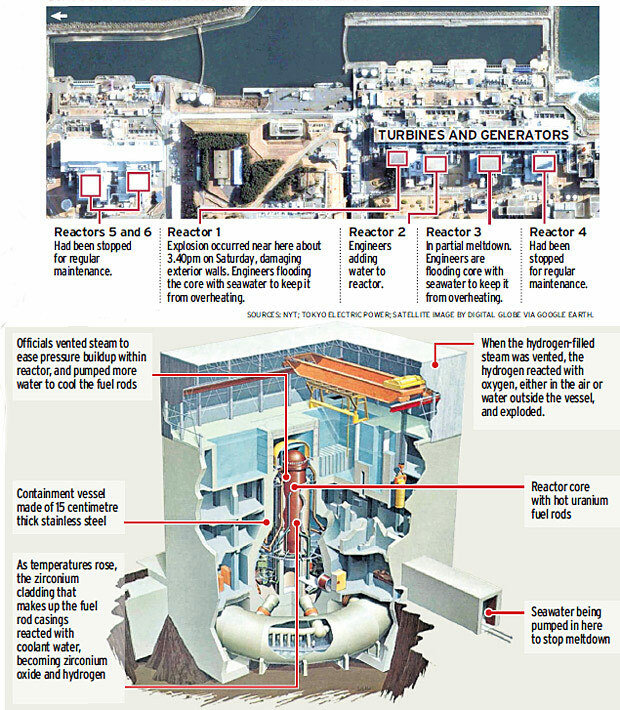 The plant’s operator, Tokyo Electric Power, said late Monday that repeated efforts to inject seawater into the reactor had failed, causing water levels inside the reactor’s containment vessel to fall and exposing its fuel rods. After what at first appeared to be a successful bid to refill the vessel, water levels again dwindled, this time to critical levels, exposing the rods almost completely, company executives said. Workers were having difficulty injecting seawater into the reactor because its vents — necessary to release pressure in the containment vessel by allowing radioactive steam to escape — had stopped working properly, they said. “They’re basically in a full-scale panic” among Japanese power industry managers, said a senior nuclear industry executive late Monday night. The executive is not involved in managing the response to the reactors’ difficulties but has many contacts in Japan. “They’re in total disarray, they don’t know what to do.” …. “In October 2010, Oak Ridge National Laboratory released ―Electromagnetic Pulse: Effects on the U.S. Power Grid,‖ a series of comprehensive technical reports for the Federal Energy Regulatory Commission (FERC) in joint sponsorship with the Department of Energy and the Department of Homeland Security. These reports disclose that the commercial power grids in two large areas of the continental United States are vulnerable to severe space weather. The reports conclude that solar activity and resulting large earthbound Coronal Mass Ejection (CME), occurring on average once every one hundred years, would induce a geomagnetic disturbance and cause probable collapse of the commercial grid in these vulnerable areas. Excess heat from induced currents in transmission lines would permanently damage approximately 350 extra high voltage transformers. The replacement lead time for extra high voltage transformers is approximately 1-2 years. As a result, about two-thirds of nuclear power plants and their associated spent fuel pools would likely be without commercial grid power for a period of 1-2 years. Point being–this quake-and-tsunami is one way, but not the only way, to cause problems at all fission power plants and all the backup power systems over a large area, all at once. The preparations for power failure seem to have been for one or two failures at a time, assuming there would be redundant sources nearby not damaged. A solar flare will do the same sort of thing over a larger area. It’s a study of a different situation I think (“without SCRAM”) but may be cautionary, since I recall early mention of radiation keeping workers from reaching one of the valves on the first reactor the first day, and we’ve been hearing about more and different equipment failures preventing things from being done. … this quake-and-tsunami is one way, but not the only way, to cause problems at all fission power plants and all the backup power systems over a large area, all at once. The preparations for power failure seem to have been for one or two failures at a time, assuming there would be redundant sources nearby not damaged. Dr. Dan Meneley was on the radio this morning and pointed out that when the water came in, the generators’ diesel tanks floated away. The irony of nuclear installations depending on this fossil fuel kit has struck me in the past. Why wouldn’t they depend on small standby nuclear generators? In my old days in steam engineering we were using steam driven injectors to deliver water into boilers as a permanent water feed mechanism or as back up to some more efficient mechanical pump. The injectors work on principle of mass inertia, hence it is possible to deliver water into the boiler at higher pressure than is present in boiler steam pressure itself. I believe the same device could be used to feed water into nuclear reactor by utilizing the steam generated by reactor from decay heat. This would be only good to supply water for evaporation for as long as the heat energy would exceed the demand for water. The volume of water needed to remove residual decay heat by evaporation from 3 million kw thermal energy reactor (1Gwe, gigawatt electric) with residual decay heat of 3%, 90,000kw thermal decay right after shut down, is about 122,290 liters per hour. Advantage of the water injector is that it has no moving parts, therefore it is a bulletproof device for emergency water feed. I don’t know what the thermal output of those BWR in Japan is, however, the above example will give you the idea how much water is needed to remove residual decay heat by evaporation. Removing the heat by water cooling alone would take approximately 10times as much water volume or more, depending on cooling water temperature rise. I think you deserve a right of reply to the ABC. Sir Christopher Busby was a maniac this morning and said the words ‘possibility of an atomic explosion’ or ‘nuclear explosion’ about 4 times in the short time he had on the radio. You did not answer the question in the video. NEWSFLASH: Giant Radioactive Ducks spotted over Tokyo! Giant Radiactive Ducks were spotted terrorising the Japanese coastline, and are probably in the vicinity of Tokyo from previous bearings! In other news, Sir Christopher Busby announces high risk of ‘atomic explosion’ at the reactors, and says the words ‘nuclear explosion’ 4 times in a short radio interview on the ABC this morning. Most of us thought these were nuclear power plants, not bombs, but in a world with the Giant Ducks of Doom about to descend on the Japanese people, anything is possible! More seriously now — 10 thousand people may have been killed by this Tsunami. Do we really need to add to Japanese public trauma by terrifying them with reports of impossible threats of ‘nuclear explosions’ from power plants? This is one of the most uninformed, unscientific media frenzies I’ve ever witnessed, far worse than that ‘climategate’ fizzer. I agree with Peter Lang that nuclear safety is overblown in certain areas, hence it contributes to no additional safety, however, despite all the safety hype, there was one serious mistake made at the dawn of nuclear industry and that mistake remained to this day due to political reasons. Total reliance on electrical pumps and electric back up did not meet the natural safety criteria. It was known at the time and some engineers voiced their concern. Alvin Weinberg, the inventor of light water reactor, was fired from his job because he voiced his concerns over safety. Nevertheless, the politics prevailed thus electric system was adopted as standard and it was copied due to monkey see monkey do copycat attitude, or “It was always done this way” mentality. Recent events in Japan showed that mother nature easily outsmarted the electric system because there was no natural line of defense that nature would have to cooperate with. Nature is completely ruthless, however, it will always obey it’s own physical laws, so those laws must be incorporated in any design as much as possible. Long ago the mistake was recognized, hence all new reactor designs utilize passive natural reactor cooling system of some sort. Nevertheless, as always, people have to live with political consequences of the past. Nuclear peaceful energy is somewhat forgiving even under the most severe conditions. The biggest mistake of all would be to abandon this fantastic form of energy, best energy nature has to offer. They are not, Ron — the repositioning would have nothing to do with the trace levels of radioactivity they might be able to detect. Note – I’m not an alarmist but facts are facts. Evacuating nearby citizenry, or repositioning carriers based on wind patterns would be appropriate in a very wide range of conditions, from relatively low-risk to relatively high-risk. It is possible for some generally reasonable people to read “impending doom” from those activities, as well as for others to see “prudent additional precautions”. However, people with more expertise, more information, and much more to lose are making those calls, and I see little reason for them to falsely-minimize the danger in hopes of … what? Hoping no one will notice if they’re wrong?! Prime minister Naoto Kan has begun his address to the nation by asking people to listen to his message calmly. He has asked anyone remaining in the 20km evacuation zone around the number 1 plant and the 10km zone around the number 2 plant to leave. Hundreds of thousands have already been evacuated. He a said workers were “putting themselves in a very dangerous situation” to try to contain the problems. He again requested people to remain calm. Yukio Edano, the government’s chief spokesman, is now on. He’s saying there’s a fire in the number four unit. There are no fuel rods in there but it still contains spent fuel rods. (The unit was under renovation at the time of the quake and tsunami). He says there seems to have been a hydrogen explosion (as at units 1 and 3) in that unit too. There were not previously thought to be problems with unit 4. As of 10.20am (Japanese time), they have taken readings which indicate levels of radiation that could impact human health. Edano has asked them to “embrace the information calmly”. He says beyond the 20km radius the level should be reduced to one where harm to human health would be minimal or non-existent. But he says that spread will of course depend on wind speeds and direction. He asks people to remain indoors so they are not exposed to any radiation that may come their way. “much higher than microsieverts” — this is seriously bad. Barry, the helicopters are flying relief missions to the land; I’d think they’d move the ships so the path the helicopters fly does not cross downwind of the plants, to avoid the need to decontaminate them. And with the new readings, this is serious. The news is telling people not to allow air exchange between indoors and outdoors, in the 20-30km radius zone. Close the windows, do not take your laundry in if it is hanging outdoors, do not hang laundry outdoors, if you are outside right now please evacuate to a nearby building, make sure that you dust off your jacket and anything in your hair and then go indoors. This is because of the fire at Reactor No. 4, apparently because debris falling onto the top damaged something involving the spent fuel cooling pool up there. The speaker at the site http://live.nicovideo.jp/watch/lv43296023 (live stream) is saying the water cooling system for the spent fuel pool on top of No. 4 may have been damaged by stuff falling from the other explosions, and discusses the possibility both of hydrogen building up in the top of that building, and of the water level going down to expose the spent fuel in the time since the first two explosions. The TV is now steadily repeating how to avoid carrying fallout indoors, leave laundry and jackets and shoes outside, close windows, do not use ventilation. This means, with no electricity, no heat, and they’re predicting rain and temperatures falling toward freezing. “400 millisieverts” is the peak reported at the site. “Flames are coming from the 4th floor on the northwest corner” of No. 4 plant. In several of the photos there would appear to be steam issuing from the central portion of reactor 3, does this not mean the calandria is venting? The japanese media are now reporting a “failure” in the torus at the bottom of unit 2, but with few specifics. Uh oh… I’m hearing news of a 400 milliSievert (not microSievert) reading somewhere. Not sure where it’s coming from, if the reactor vessels are still intact. The pool? Is there enough information here to constitute any conclusions? just pray they are fine, the earthquake and tsunami have killed lots people, so that don’t make them worse. Radiation 33 times normal level measured in Utsunomiya, Tochigi. This is ~50 miles SW of the site. Is all hell breaking loose Chernobyl-style, or is the original thesis still in-tact (non-harmful radiation levels)? TL:DR it is a very low and unimportant spike. I read this morning that some American officials are critical of Japan’s handling of the nuclear situation. Good grief! And this from a country that completely fouled up the response to a relatively simple hurricane disaster in New Orleans! Japan was hit by one of the most powerful earthquakes in recorded history and a massive tsunami which destroyed entire towns, roads, communications, utilities (electricity, water, sewer, etc. ), mass transit, airports, etc. Japan also has a volcanic eruption on its hands as well. Thousands of people are dead. Crews are searching for possible survivors and collecting thousands of drowned bodies from beaches. They are checking people for radiation exposure and in the process of moving half a million people to safety in shelters should the triple meltdown occur. Food is not getting through. It’s very cold and people are without power for hours on end due to rolling blackouts. Access to water is a problem for many. What about bathing facilities? Clothing and bedding for people who lost everything? Medical care for the sick and injured? Prescription medication for those who lost theirs in the tsunami? The despair and pain of those who have lost family members, friends and possessions? No time for grief counselling here. And Americans (who still have not repaired the damage wrought by Katrina) have the gall to criticize? Japan just happens to be much more organized and better at emergency response than the US. Check the record. And by the way, there are over 200 radioactive leaks from nuclear power stations in the US EVERY DAY. You’re not informed about it, so I guess it doesn’t exist. Barry, thanks so much for your scientific enlightening to a largely misinformed public. I’d like to hear you perspective and opinion of the HTR (High Temp Gas Cooled Reactors). They are supposed to be the answer to safer and easier to manage nuclear power generation. Is this what they refer as Gen IV and is the technology there yet to build a full-scale reactors of this type being that many smaller (proto-types) have already been built in Japan, China, S Africa, and elsewhere? My understanding is that these plants can’t be subject to a meltdown from an earthquake,tsunami, or any other natural disaster.